Hello, I’m new to the forum and I’m learning to use this fabulous Valentina software. I made my very first pattern (a skirt), I drew the measures, the points and finally the curves as it should - well I think). I went to go in isolation and cutting plan. After that I wanted to go back into model making to change the place curves or cancel points but I can not do it. After going in isolation and cutting plan is over, we can not change anything? or is there a trick to modify the points and curves? bonjour, Je suis nouvelle sur le forum et j’apprends à utiliser ce fabuleux logiciel Valentina. J’ai fait mon tout premier pattern (une jupe), j’ai tracé les mesures, les points et enfin les courbes comme il fallait - enfin je crois). Je suis ensite allée dans isolation et plan de coupe. Après cela j’ai voulu allé en arrière dans modélisme pour changer les courbes de place ou annuler des points mais je n’y arrive pas. Après être allée dans isolation et plan de coupe c’est terminé, on ne peut plus rien changer? ou y a t’il une astuce pour modifier les points et courbes? If you wish to change or add curves or points, you need to be in Draw. 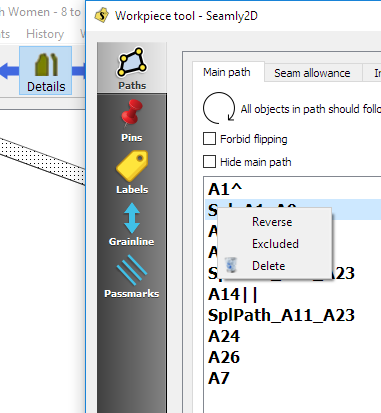 If you wish to cancel a point chosen, you need to be in Detail - right click on the pattern piece and select Options, right click on the point that you wish to cancel and select Exclude or Delete. Hi Grace thank you for your explanations very clear. I tried as you showed me and I succeeded. Thank you very much for taking time for me.